As districts around the state begin reaping the benefits of Illinois’ new school funding formula, Democratic lawmakers who just happen to be up for re-election gathered today to remind voters that Republican Gov. Bruce Rauner initially vetoed that funding, and likewise vetoed legislation that would raise minimum teacher salaries to $40,000 over the next five years. 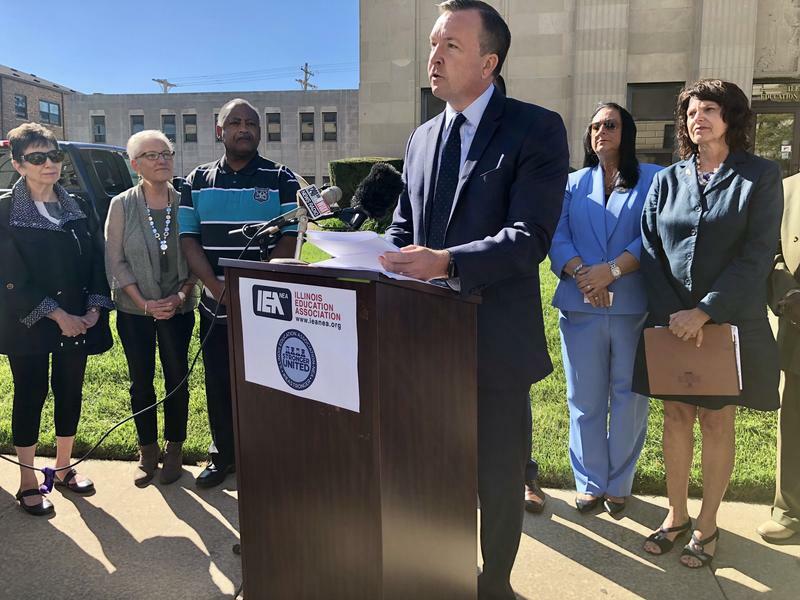 State Sen. Andy Manar (D-Bunker Hill), who sponsored the legislation and is seeking re-election, says it’s possible to get enough votes to override the veto when the General Assembly convenes shortly after midterm elections in November. “I would anticipate, just from my own experience, that the outlook on controversial bills — though I don’t know why this one is controversial — is much different during veto session than it is during spring legislative session,” Manar says. Rep. Will Davis (D-Homewood), says that timing may help. Under current law, districts can pay teachers as little as $10,000 per year. No district does that; starting salaries for teachers in Illinois’ lowest-paying districts are around $26,000 per year. But in hundreds of districts, beginning teachers still earn less than $40,000 — even if they hold master’s degrees. In his veto message, Rauner called the salary minimum an unfunded mandate, and argued that districts should have local control over teacher pay. Rauner also suggested districts could base teacher pay scales on job performance.